Join your fellow CSU alumni for an evening of networking at the Rubin Museum of Art in Chelsea. Melissa Dahl ('07, Sacramento State), senior editor of "Science of Us" at New York Magazine and author of Cringeworthy: A Theory of Awkwardness, will join us as the alumni guest speaker. Chancellor Timothy P. White and several campus presidents will be in attendance. 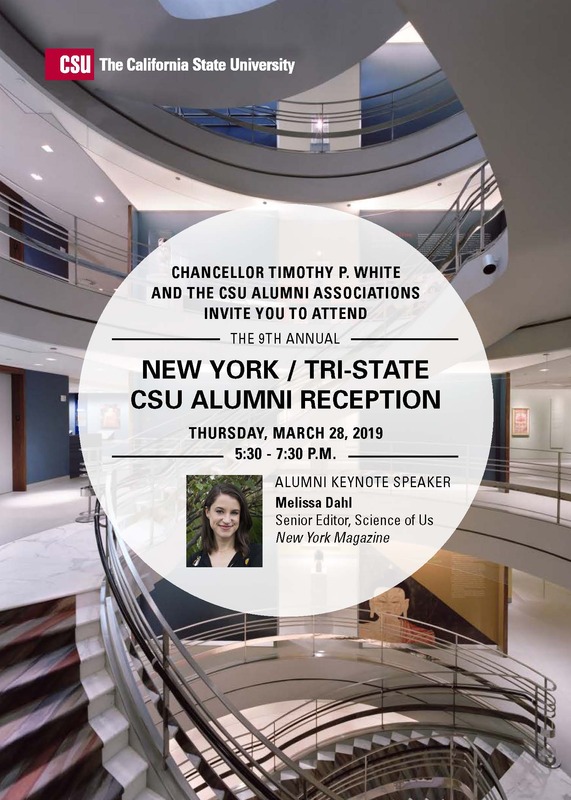 This will be a great opportunity to meet other CSU alumni in all fields of business throughout the Tri-State area. Hors d’oeuvres and a hosted bar are included in your registration. Guests are welcome but space is limited so please RSVP no later than March 22 at 12 p.m. (Eastern) using the registration link below. Pre-event registration is required. Walk ups are not possible at this venue.